Florida Atlantic University is a StormReady® University. All FAU campuses are recognized as StormReady®. Approximately 90% of all presidentially declared disasters are weather related, leading to around 500 deaths per year and nearly $14 billion in damage. StormReady® began in 1999 to help communities validate their communication capabilities and safety skills needed to respond to severe weather. StormReady® communities are better prepared through improved planning, education, and awareness programs. While no community is storm proof, being StormReady® does help save lives. What does it mean to be Storm Ready? There are six guidelines describing the requirements that must be met to qualify as a StormReady® University. All StormReady® communities must renew their designation every three years. Below is a description of the requirements met by Florida Atlantic University. FAU also has an Emergency Operations Center (EOC). Members of the EOC include senior administration, key decision makers, and the emergency management staff. The University President or designee can activate the EOC based on established procedures. In addition to the above sources of weather information; FAU utilizes the internet and mobile device access as a means of gathering ancillary weather information including high definition and Doppler radar. FAU Alert modules may be utilized as a means of ensuring timely warnings to the University community. Skywarn® is the National Oceanic and Atmospheric Administration’s (NOAA) National Weather Service’s (NWS) severe weather spotting program with nearly 290,000 trained volunteers nationwide. The NWS’s mission is to protect lives and property. When weather conditions are favorable for severe thunderstorms or tornadoes are expected to develop, a severe thunderstorm or tornado WATCH is issued. A Severe Thunderstorm or Tornado WARNING is issued when severe weather has been reported by a Skywarn spotter or indicated by Doppler radar. Skywarn volunteers become the NWS’s and local Emergency Management’s eyes and ears, helping to provide better weather watch and warning services. The FA U Storm Spotter is a university-wide network of volunteers trained by the NWS to report significant weather. Everyone is encouraged to participate. If you would like to join our storm spotter team, please send a request via email to em@fau.edu. The NWS and/or the local emergency management authorities may activate the Storm Spotter net whenever there is a threat of severe weather or the NWS issues a severe thunderstorm or tornado watch. In this case information may be relayed through amateur radio repeaters. • Telephone severe weather observations immediately to the University Police at (561) 297-3500. (When in doubt, make your report anyway). 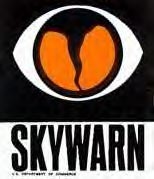 • Identify yourself as a trained Storm Spotter and provide your SkyWarn® certification number. • Provide your name and location. • Give the details. Always use the "Four Ws" when reporting. • Report any strong winds (50 mph or greater), or any wind that produces damage. • Report any hail. Refer to hail size in comparison to coin (dime, nickel, penny, quarter). DO NOT mention "marble" size hail. • Report funnel clouds, wall clouds, tornadoes or water spouts. Remember, rotation and persistence are the keys! • Report damage (even well after the event). • The direction and distance from a known location or intersection. • Make sure you note the time of the observation. • Describe the storm’s direction and speed of travel, size, intensity and destructiveness.